Broadview is a gracious and comfortable 6-sleeper cottage owned by Hennie and Gloria, long time residents of Sedgefield who bought the cottage some 20 years ago. 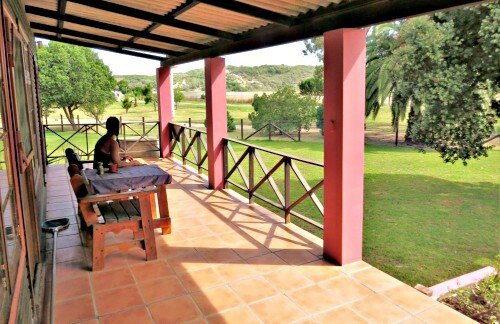 Front Verandah at Broadview overlooking the Swartvlei Estuary. Prior to that a dear old hermit had lived in it and when he died suddenly of a heart attack while swimming in the lagoon, Gloria, who lived close by was interested in buying it. The family that had inherited it had a tenant living in it by then and the overgrown neglected garden did not appeal to Hennie. She eventually persuaded him to put in an offer that was accepted and then work began to clean up the garden and upgrade the house. The ground was cleared of years of recycling garbage stored in containers and scrap metal that made the chap who collected it a fortune. As the overgrown shrubbery was cut back, a swimming pool emerged that was thought to be a froggie pond because of the croaking that had reverberated from it around the neighbourhood at night. Seven huge water-guzzling Eucalyptus trees were removed from the garden and it began to look presentable. 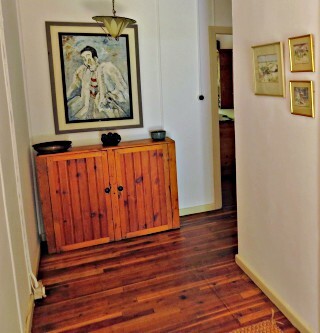 Inside Gloria and Hennie tastefully opened up the living area and modified the bathrooms and bedroom area. They successfully converted Broadview into a welcoming and spacious holiday cottage that can comfortably accommodate 6 people. 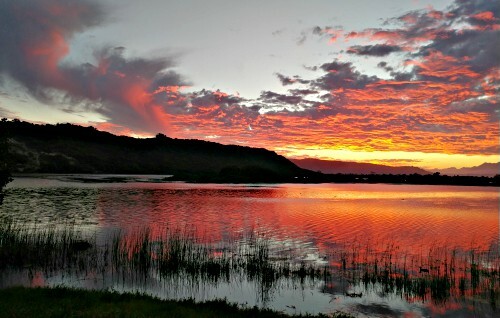 Overlooking the Swartvlei Lagoon and its abundant bird life, it is nonetheless within easy walking distance of all the central amenities - the shops and restaurants of Sedgefield village, making it is an ideal holiday spot for a family. It is also cosy and comfortable enough for "swallows" - overseas folks who seek warmer climes to escape the northern hemisphere winters. A welcoming entrance hall leads to the open-plan living area, or directly to the kitchen or up the passage that separates the living areas from the sleeping areas. The lounge and dining-room is open-plan, a pleasant roomy space that is comfortable and relaxing. It has a built-in fireplace. A Sun-room at the front of the house overlooks the swimming-pool and provides a natural sun-trap on winter days and chilly evenings. The kitchen is well equipped.There is a full 4 plate stove and oven, microwave oven, fridge/freezer and separate deep-freeze. All the regular crockery and cutlery is supplied along with a toaster and kettle. An outdoor braai is also provided. The three bedrooms are tastefully decorated with adequate storage space for personal belongings. Separate bathroom and a shower rooms provide the cottage with adequate utilities (neither is en-suite). A washing machine is neatly tucked away in one of the cupboards. The cottage has a fenced swimming pool that you may use at your own risk. A lock-up garage with an extra high door secures your vehicle. It is pet friendly on request. This cottage in an area of exquisite natural beauty is the perfect spot for photography enthusiasts, birders, cyclists, canoeists and walkers.